This is a little pencil face doll with a nicely shaped body, little arms and legs that a petite and hand sewn. Her face is visible with two dots for eyes, straight line for a nose and a straight line for her mouth, no funny business just a good little face. She has a sewn on blouse and petticoat and the cape and skirt I gave her. I have had the cape and skirt hoping to find a doll for it and it fits her perfectly. 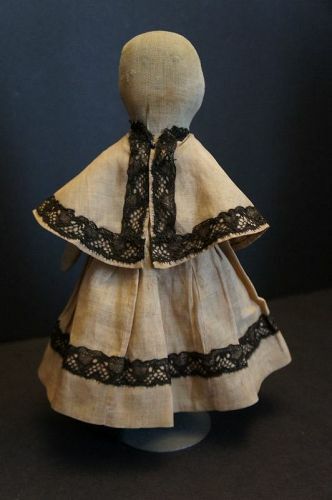 She is circa 1880 and is 10 1/2" tall Forgot, she is missing the bottom half of her left arm.